Kenny Jackett revealed the Blues skipper could move into a slightly deeper role after dropping down the striker pecking order. 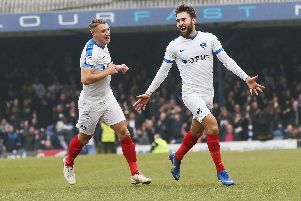 The January arrivals on Omar Bogle and James Vaughan – on loan from Cardiff and Wigan respectively for the rest of the season – has meant Pitman’s missed out on a place in Pompey’s match-day squad for the past two league games against Doncaster and Plymouth respectively. The former AFC Bournemouth and Ipswich marksman, who was the Blues’ 25-goal top scorer last term, also played a support-act role to Oli Hawkins during the first half of the campaign. He’s scored seven goals in 29 appearances to date this season. But with Jackett considering giving wingers Jamal Lowe and Ronan Curtis a rest, the boss would have to reshuffle his pack. Gareth Evans has featured in the number-10 berth for the majority of Pompey’s League One promotion push. Taking Lowe or Curtis out of the starting XI could see Evans return to the flank, however. And that may prompt Pitman’s recall to feature in the hole behind the lone striker. Blues boss Jackett said: ‘For Brett, his preferred position would be to drop into the number-10 role behind a big man anyway. ‘It hasn’t quite happened between him and Oli Hawkins in the past if I’m being quite honest. ‘It hasn’t necessarily worked. I thought it maybe would, and we’ve been relatively successful this season. ‘But that’s not to say it might not happen with Bogle or Vaughan. ‘The option is very much still open and I see it, as a means of strengthening our options. ‘Whether he drops in behind, we’ll see. It is an option and we’ll see, but it wasn’t an area we wanted to get weaker. Evans’ high-energy performances have been key to Jackett’s system this term. The manager accepts Pitman would function differently in the role to his team-mate. ‘Brett plays it slightly differently, there’s no doubt about that,’ added Jackett. ‘Gareth has had a lot of games and the mileage he runs is absolutely massive. ‘He has been in a situation where he’s got goals and played well for us.